Two weeks or so ago, I had a very interesting night that started off with a great meal at Bocadillos, Gerald Hirigoyen's tapas bar. Considering it was a Friday night, it wasn't too crowded so we waited around at the bar for 10 minutes. 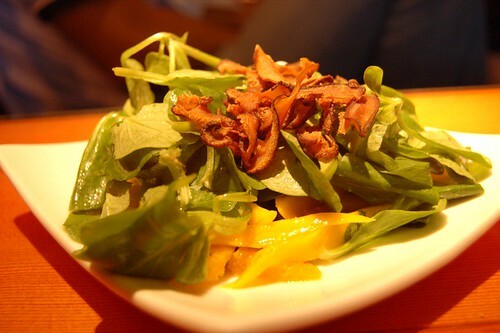 The salad was light and refreshing, with a generous amount of mango. The best part were the the crispy mushrooms, which were aromatic and addictive. They had similar texture to fried bacon; a wonderful addition to any salad. The lamb was juicy, tender, and done perfectly medium-rare. It was a bit unevenly salted, but the majority of my piece had the right amount. The chutney was delicious and helped balance the saltier areas of my piece. 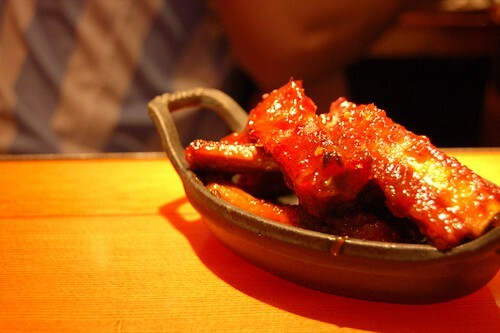 The ribs were tender and the glaze was delicious, almost resembling the sweet hoisin sauce inside Chinese barbequed pork buns. I liked these just as much as the smokier and spicier traditional BBQ ribs from Everett and Jones. Service throughout the night was pretty bad; we had to flag down our server from afar, since she never came by, except to drop off our food. Though we were still hungry and wanted dessert (arm of a gypsy), we decided to pass since we didn't want to wait for a rare sighting of our server. Also, there was an obnoxious Marina whore yelling about her promiscuous escapades at the next table; it was quite vexing and repelling, to say the least. As we left the restaurant, we got lured into the Church of Scientology across the street. All I really knew about Scientology was that it involved a volcano, aliens, and Tom Cruise; I just couldn't resist. Inside, the decor is tacky, busy, and clashing: very Vegas-casino-lobby, but more so the Golden Nugget than the Venetian. The area to the left consists of several wooden desks, giving off the vibe of a loan office more so than a church. The rest of the space consists of giant posters mounted on wooden panels describing the founder and the roots of Scientology. There is also a mysterious circular area bordered off by posters describing the philosophy and teachings; in front of this area is a podium and a tacky bust sculpture of the founder. Behind are huge speakers playing some cheesy beats, sort of like really bad easy listening with an overzealous singer. Anyway, as we roamed around, we were approached every five minutes by the creepy guy who stood in front and lured us in. He exuded the mannerisms of a used car salesman, and he was convinced we were as passionate as he. The guy was absolutely made for this job. The church is open late (it was around 10 when we went), I assume to attract and convert the nightlife crowd. Oh, they also have a cheese platter in the back, but it was unfortunately empty when we got there. 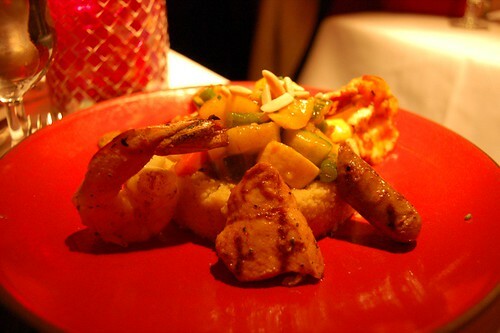 I urge you to check the place out, and of course have a meal at Bocadillos. Zuni Café is a San Francisco institution; in other words, people will think I am a hack for not loving it (how dare she?!). I’ve been to the restaurant two times, once for their signature dishes, and another only for the oysters. The space is beautiful, the service is great, but the food really does not measure up to all the hype. 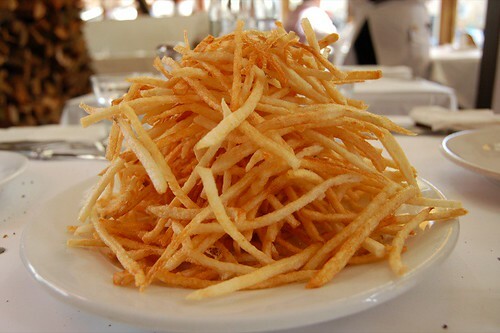 The shoestring potatoes, which came first, were probably the best part of the meal. Light and crispy, they’re so addicting you don’t realize you’ve already finished half the plate. And then you continue eating because they’re probably the best fries you’ve had in a while. Too bad it went downhill from there. The pizza was mediocre. The crust was gummy, and the sausage didn’t really taste like anything except small lumps of salt. Nothing in the toppings balanced out the savory, and the crust was pretty abysmal. 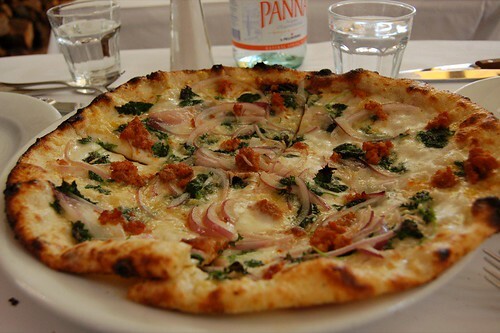 I’d take Pizzetta over it any day. 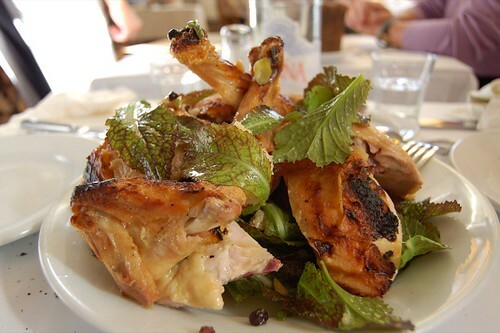 Now, the grand finale: the legendary wood-oven roasted chicken that takes 50 minutes. I was quite excited when the huge plate arrived because it looked and smelled amazing. Biting into a drumstick, the flesh was tender and juicy; there wasn’t much in terms of flavor, though. Sure, there was the nicely browned and herbed skin, but the meat was really lacking. As I progressed to the less desired parts of the chicken (the breast), the flesh was downright dry and tasteless. It’s the kind that mops up the moisture in your mouth and gets stuck in your teeth. The bread salad was alright, since it tasted more like chicken than the chicken itself. It really intrigues me why Zuni has such a strong following, with all the finer choices in this city. Equally intriguing is why people were so distraught when Bizou closed. I went there for my prom night dinner, and the food was way below average. I do understand and appreciate ingredient-driven, simple preparations; and as much as I wanted to, I did not enjoy these restaurants because the food was sub par. Oh, I also hated Medicine Eatstation, so now I’ve lost all credibility. I love restaurants that have names that are palindromes. In fact, I don't think I have been to any other palindromic restaurants to my memory. Anyhoo, I had a very good meal at Aziza a few weeks ago. The decor is nice, albeit a bit out of place for the Richmond. Am I ridiculous to take pictures of bread? 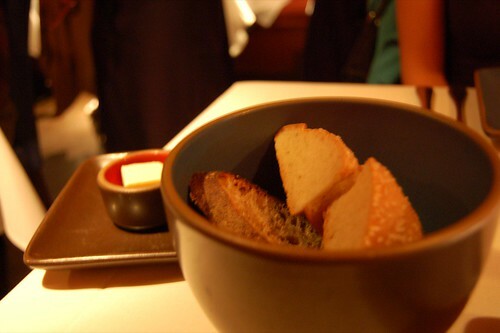 In any case, we got a bowl of bread. With butter, no less. 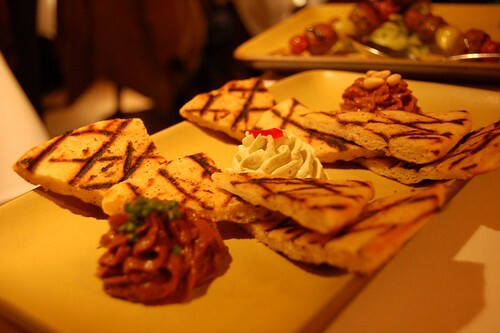 This was a good appetizer, better than Kokkari, in my opinion. My favorite spread was the pomegranate, which was a great combination of smoky, tart, and nutty. The eggplant was also good, but a little subdued. The yogurt-dill didn't impress. 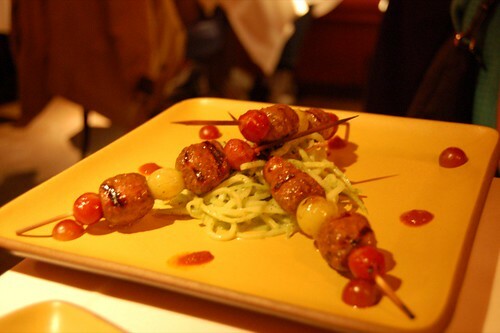 I usually tend to stay away from beef skewers, because they are often overdone. 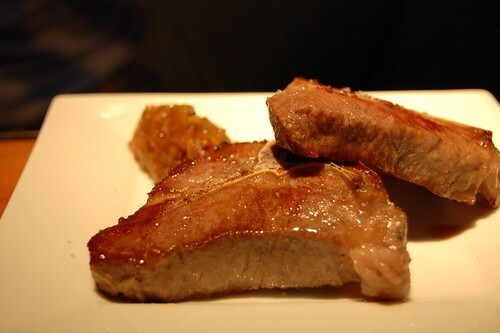 However, I did enjoy these: the beef was tender and marinated well. The grapes helped to balance out the spices in the beef. I had a hard time deciding among the squab, rabbit, hen, and lamb--ok I guess that's just about everything on the meat menu. Anyway, I settled on the rabbit, which was prepared two ways: confit (the chunk in the middle) and seared (the disks around the plate). The meat was tender, juicy, and flavorful. There was a bit too much sauce, which became too salty. I enjoyed the pairing with carrots; I guess I got to eat the rabbit's food as well. This is great for the indecisive, since you get everything. D ordered this, so I got a taste of the couscous. I really liked the texture of the couscous, and the sausage was great. I still prefered my rabbit though. Aziza has a great dessert menu, which I had some trouble choosing from. 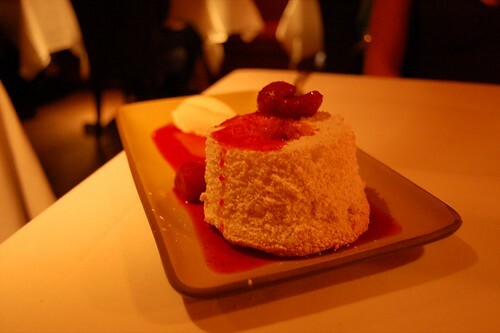 We settled on the angel food cake, which was, thankfully, not too sweet. The spicy black pepper really worked with the delicate lavender, unlike the disappointing peppercorn-accented desserts I had at ChikaLicious. Service was wonderful. Our server was wonderfully patient with my ambivalence and familiar with the menu. 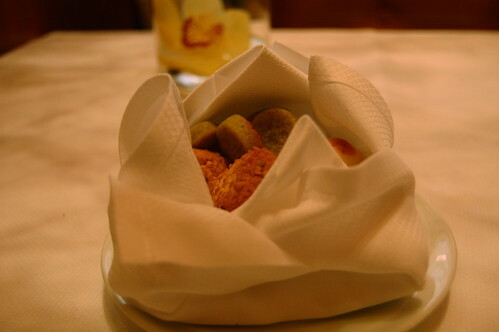 They (the chef, apparently) also comped us some spiced almonds and extra flatbread. I really do wonder why I keep getting free things. Weather in the Bay Area has been mighty dandy. That fact has made me even lazier to update this thing. So what's up with the lame title? Today I met up for lunch with no other than the Restaurant Whore herself, Joy. Over Out the Door fare, we exchanged tales of the alma mater, life, and surprisingly enough, food. Not only is that girl amazingly funny and kind, she keeps it real. So check her out, not that you haven't already. I am quite backlogged with SF posts, which will come soon. 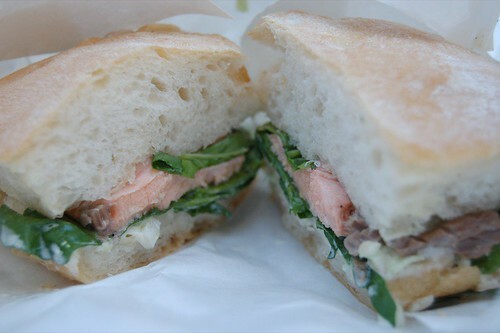 I can't stand to end an entry without a photo, so here is a sandwich I had last week at LuLu Petite in the Ferry Building (I guess I really am there every other day). This is something I would buy on a typical work day. 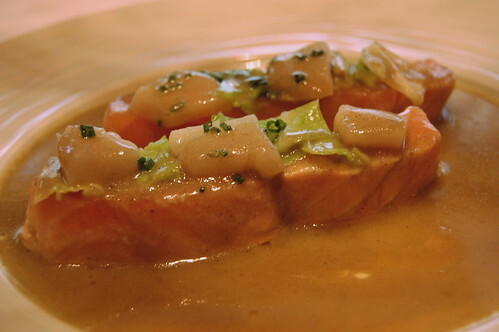 I felt the salmon was a bit bland; it was poached, rather than grilled as I had expected. I didn't taste much citrus either. I had to use my imagination for much of it, sort of like eating the travesty that is Tasti D-Lite. I thought that since now I'm working instead of college-ing, I'd update a bit more often. But it turns out that even without exams or projects, I'm so drained that blogging is the last thing I have energy for. Anyway, this post concludes the NYC meals, so I can move onto Bay Area ones. 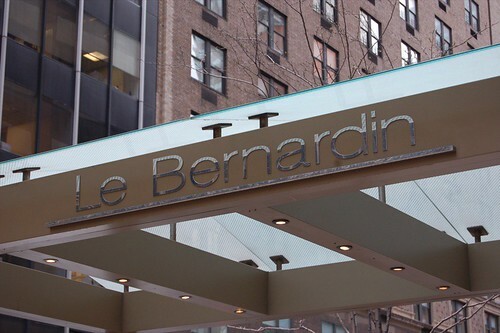 Le Bernardin is Eric Ripert's 4-star seafood mecca and one of the city's best restaurants; I'm glad to see it make Restaurant Magazine's best list this year. The wood-paneled dining room is grand, without being too glitzy. The nautically themed paintings are quite soothing and overall, the restaurant exudes the ambiance of a yacht. 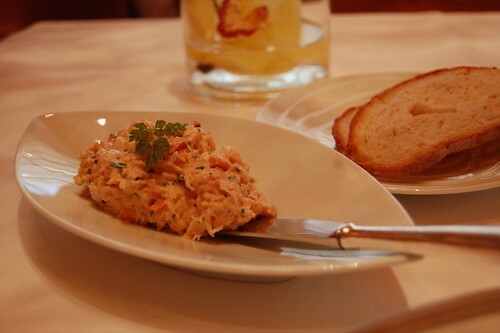 The meal starts with toasted bread and a smoked salmon spread. The spread was fresh and creamy; good way to kick up my appetite. This was excellent. 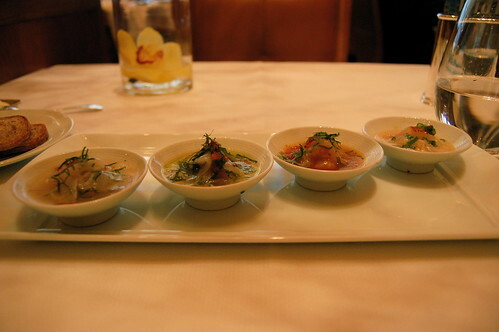 The first ceviche started out simply, with a very simple citrus marinade. 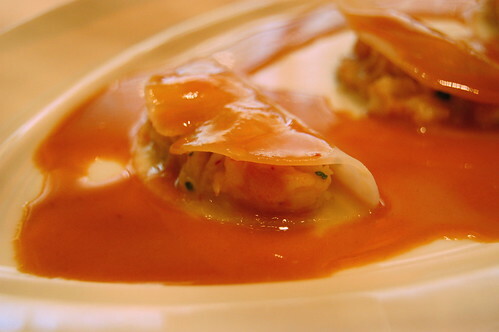 With each plate, Ripert adds more ingredients, thus increasing each one with complexity. The attention to detail was superb, and the handling of the fluke was delicious in each marinade. 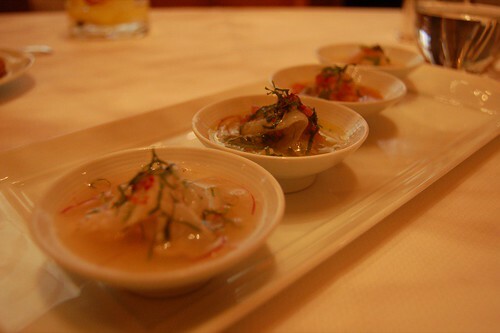 The ceviches not only varied in complexity, but also in cuisine; the first ceviche had a strong Latin influence, while the last was Southeast Asian, with the addition of coconut milk and curry. One of the most memorable things I ate during my trip. This was also delicious. 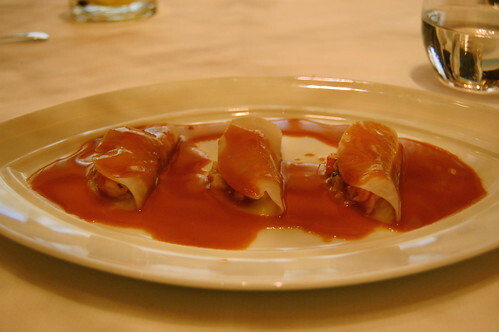 The wrappers were extremely delicate; the lobster/langoustine/shrimp was extremely fresh and had great consistency; the sauce was indulgently rich and to die for. 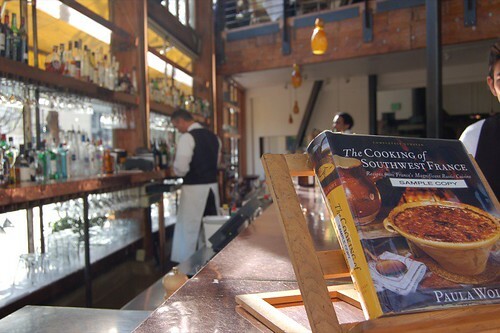 The service was impeccable; a practice rarely seen in SF but common in NY is separate pouring of the sauce tableside. A terrible picture, I know. But the soothing hues of the dining room really did not facilitate my picture taking. This was yet another very good dish. The salmon was done perfectly, barely cooked as per the description. The flesh was super smooth and melt-in-your-mouth. The sauce was so rich and earthy; pretty much like having the actual shavings. Basically, this entree incorporated a few of my favorite things: rare salmon, truffles, scallops. Heaven on a plate. This was comped by the kitchen. I didn't see any other tables receiving this, so I was quite delighted at this exclusive treat. This was divine. A great mix of sweet and savory, and so, so smooth. At this point, I was beyond sated by the superb food and service. 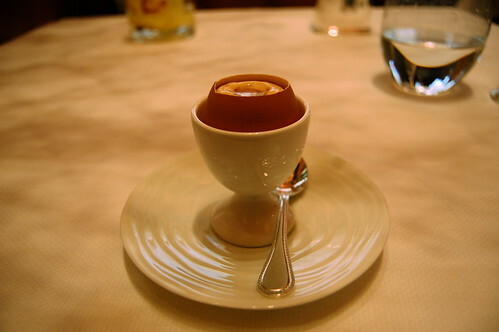 The dessert was just alright; but really, how could anything be considered great coming after the divine egg? The tart shell was a bit hard and dense, and not as crumbly as I expected. The rose cream had strong flavor, but I felt was too custardy and not light enough. The lychee was good and refreshing though. Drink was a 2001 Pommard. 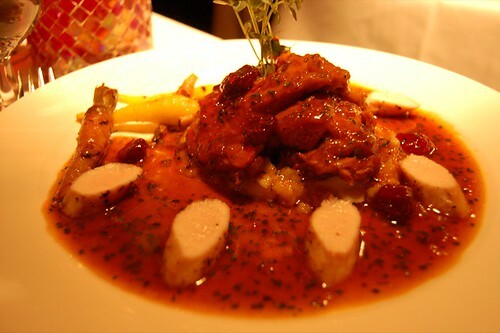 What a wonderful, standout meal; definitely one of the best of the year. 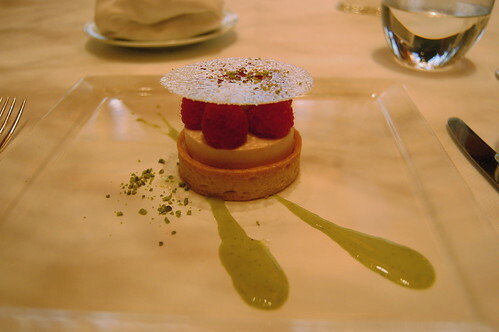 All the food except the forgettable tart was flawless; service was personable yet classy without being stuffy. If you are heading over to NY, do yourself a favor and eat here.